That put him 0.676s clear of DS Virgin Racing driver Bird in second, while Jaguar driver Mitch Evans was third-quickest, a further three tenths back. Lotterer had surged to the top of the times in the final qualifying group with a 1m36.593s, but couldn't back that performance up in Super Pole, ending up 0.924s adrift of Rosenqvist. A lock-up for Sebastien Buemi, who was third quickest in the group stages, left the Renault e.dams driver in fifth, some 1.5 seconds off the pace. Reigning champion Lucas di Grassi missed out on a place in Super Pole by less than a tenth after being demoted out of the top five by Lotterer, and will start sixth ahead of Oliver Turvey and championship leader Jean-Eric Vergne, whose points lead has been cut to 27 by Rosenqvist. 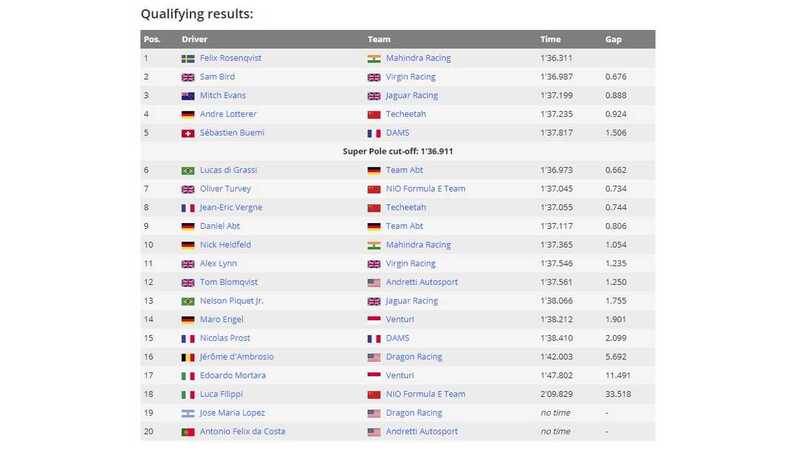 Daniel Abt and Nick Heidfeld completed the top 10 ahead of Alex Lynn, who crashed twice in practice. 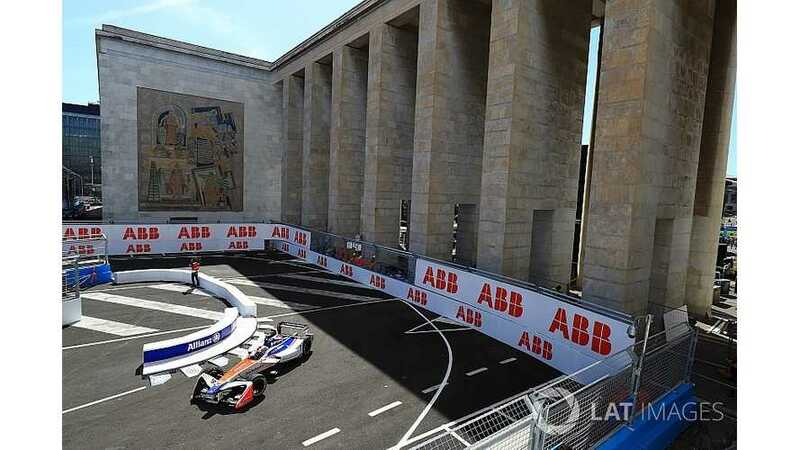 Jerome d’Ambrosio and Luca Filippi did not cross the line in time to start their flying laps in group one and ended up down in 16th and 18th after only setting non-competitive times as they got up to speed. The pair were split by Venturi’s Edoardo Mortara, who finished his group three lap with broken right-rear suspension after hitting the wall at the exit of Turn 12. At the rear of the field are Jose Maria Lopez and Antonio Felix da Costa, who were involved in a bizarre collision in the pitlane. Da Costa emerged from his Andretti garage just after Lopez had exited the Dragon pits – the two teams are side by side in the pitlane. The Andretti driver speared into Lopez at low speed and pinned his car against the inside pitwall. Both drivers were visibly agitated as they climbed out of their stricken machines and neither could take part in qualifying as a result of the incident.